Say what you will about our controversial outfielder, but one thing remains clear. 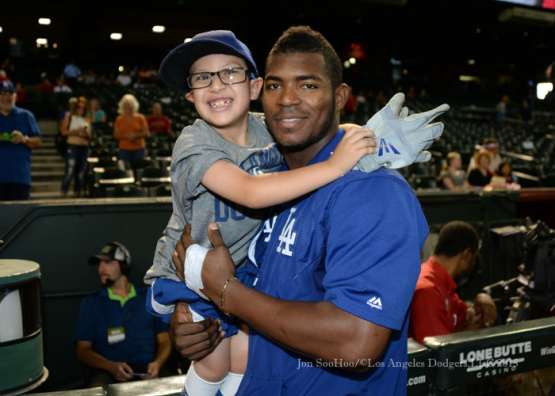 Yasiel Puig is beloved by the younger set. Kid adore him, and it's quite clear to me that he loves them back. GCRL compares the similarities and differences between the Dodger base cards found in packs and in the factory sets. Notably, AJ Ellis has two different base cards this year. Craig Calcaterra at Hardball Talk writes a fair and balanced story on Molly Knight's book about the Dodgers, here. I hope those distinctions are clear, despite my rah-rahing for Yasiel Puig. I hope that we can agree that we do not have to consider Puig the same way his teammates or the press does, as we are the audience for his baseball entertainment, not people who share close quarters with him. Put differently, I hope we are totally capable of thinking that Puig is amazing and fun in some aspects (i.e. when he takes the field) even if he is less so in others. Via Mark Saxon at ESPN, "Don Mattingly says clubhouse is 'solid' despite Yasiel Puig revelations." Via Alex Espinosa at MiLB,com, "Cal notes: Quakes' Bird sticking to stretch." "It's a little unusual," Bird said. "But I get the velocity because I'm not going to the plate quick. I'm getting my leg up high and everything is in line. I'm more direct. There's not a lot of wasted energy. It's similar to a reliever, or a closer … because from the windup, I would kind of get my direction off and lose my balance at the top of my leg kick. Going to the stretch, that's kind of been eliminated." This is an important read. From former King winger Rich Clune at The Players Tribune, "The Battle." He writes about his struggle with drug and alcohol abuse while a player. I don’t care how many times you have messed up, or been arrested, or made your family cry. I don’t care how many times you told your teammates, “That’s it, man. I’m done.” Until you are really ready to get help, nobody can say anything to change it. 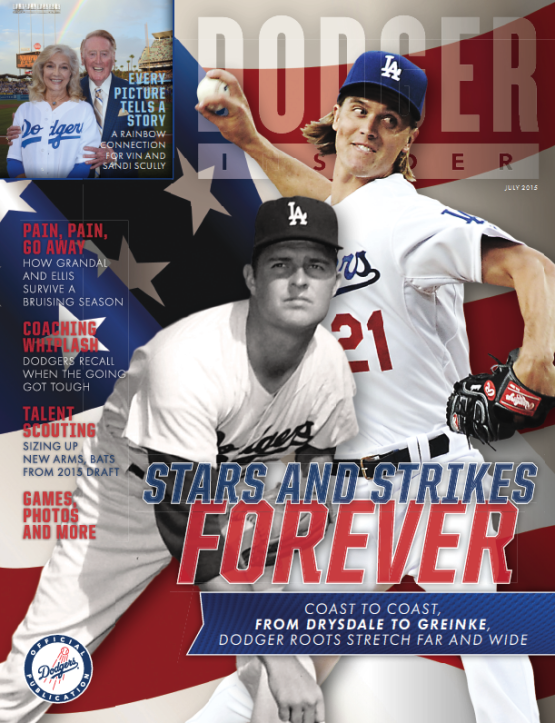 Here's a look at the July issue of Dodger Insider magazine below; featuring Don Drysdale and Zack Greinke on the cover. Jon Weisman has all the juicy details hidden inside here.